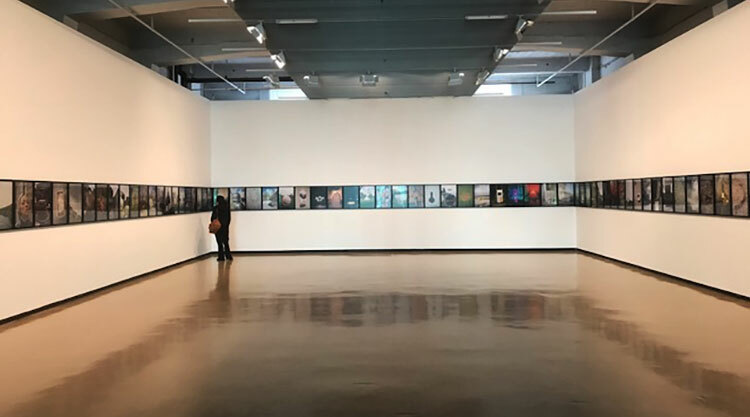 Student Simone Blaylock visited City Gallery Wellington Te Whare Toi to experience This Is New Zealand, the gallery’s current exhibition that explores the relationship between art and our national identity. “Art washes away from the soul the dust of everyday life,” says Picasso, and I discovered that nowhere in Wellington captures this sentiment quite like City Gallery Wellington. Punching above its weight with rotating exhibitions from renowned local and international artists, City Gallery lets us delve deep into a particular artist or subject—in this instance, New Zealand’s art and identity on an international stage. This Is New Zealand, the gallery’s current exhibition, examines the role art has played in shaping our national identity, sharing the work created by artists to tell our story to the world, alongside films, TV ads and early tourism campaigns, and new work that explores national iconography. John Drawbridge, New Zealand House Mural, unveiled by the Queen in London in 1963. While art exhibitions can sometimes feel intimidating or hard to identify with, the beauty of This Is New Zealand is that there is something for all of us to identify with, as we too are New Zealand. 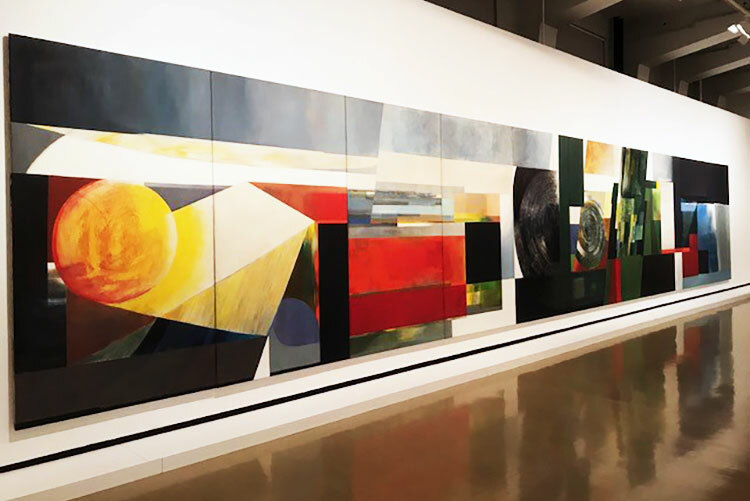 As you walk into the City Gallery, you are immediately arrested by the monumental piece, The Homely II, by Gavin Hipkins—a photographic frieze made up of eighty colour photos. As you follow the work along the walls, you notice photos taken in both New Zealand and Britain with a range of subjects and objects, from Princess Diana, to a petrol pump or even a balloon. Gavin Hipkins, The Homely II, 2001—17. Reaching the end of the photographic frieze, you can decide where you’ll branch off to next— a ‘choose your own adventure’, if you will. In the ground floor gallery to the left, you’ll encounter spectacular work across a range of mediums and decades, hung seamlessly together. Marcus King’s 1938 piece The Arrival: The Landing of the Maoris greets you as you enter, sharing space with Hugh MacDonald’s kaleidoscopic three-screen film of which the exhibition is named after. Premiered at the world fair in 1970, This Is New Zealand depicts the lives of everyday New Zealanders through a vast array of iconic national images, from the Rugby World Cup to mountain peaks, to cityscapes and country life. Moving to the ground floor gallery to the right, you’ll see This Is the Trekka by Michael Stevenson, a piece of work made up of a number of different elements throughout the room. 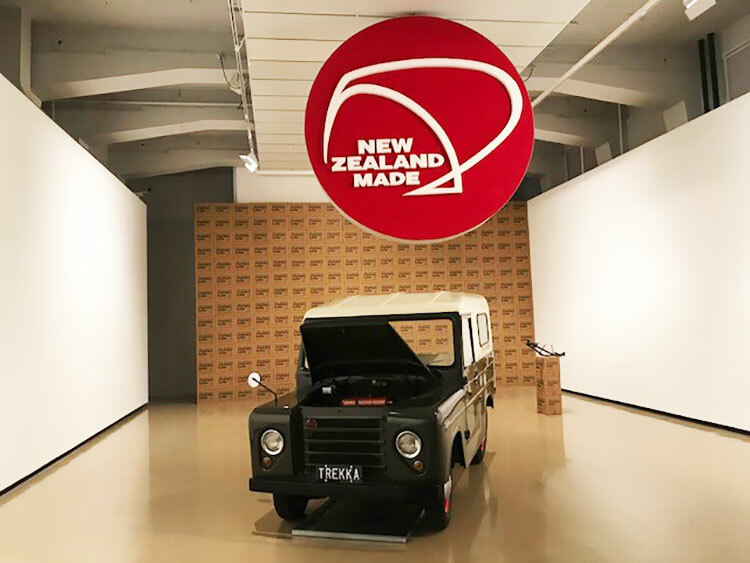 Made for the 2003 Venice Biennale, referred to by some as the ‘Art Olympics’, the room features a Trekka, New Zealand’s only homegrown car, with a huge revolving ‘New Zealand made’ sign hung above and over 100 butter boxes. Michael Stevenson, This Is the Trekka, 2003-5. Upstairs, you’ll see work by Fiona Pardington and Simon Denny, vintage New Zealand advertising campaigns and the undeniable highlight of the exhibition, the Michael Parekōwhai room. Tucked away upstairs, the walls of the room are covered in Parekōwhai’s artificial floral arrangements, which are each named after World War One battlefields where men of the Māori Battalion died. The real showstopper is the red grand piano that sits in the centre of the room, intricately carved with Māori motifs. Michael Parekōwhai, He Kōrero Pūrākau mō te Awanui o te Motu: Story of a New Zealand River, 2011, and The Consolation of Philosophy: Piko Nei te Matenga, 2001. For those wanting to delve deeper, City Gallery’s exhibition events are highly recommended. 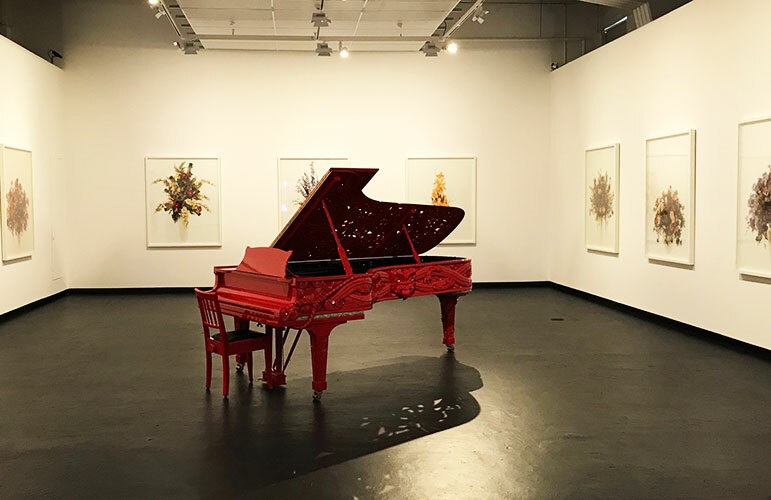 Hear Michael Parekowhai’s spectacular piano being played, and even play it yourself, or spend a night at the gallery with Tuatara Open Late evenings. There are also 30-minute introductory exhibition tours every Saturday and Sunday at 12:15pm until Sunday 15 July, when the exhibition closes. An added bonus, City Gallery is also attached to Nikau Café, which is handy for a pre or post visit flat white! Simone Blaylock is a first-year arts student studying art history and finance.